Thirteen percent of the world’s urban population lives within 10 meters (33 feet) of sea level[i]. As of 2005, about 40 million city dwellers worldwide were vulnerable to a 1-in-100 year coastal flood (one with a probability of exceeding a certain height once a century, or in other words, with a 1 percent chance of occurring in any given year)[ii]. In the United States (excluding the Great Lakes), 8.4 million people (or approximately 3 percent of the 2000 population) live within the 1-in-100 year flood zone[iii]. 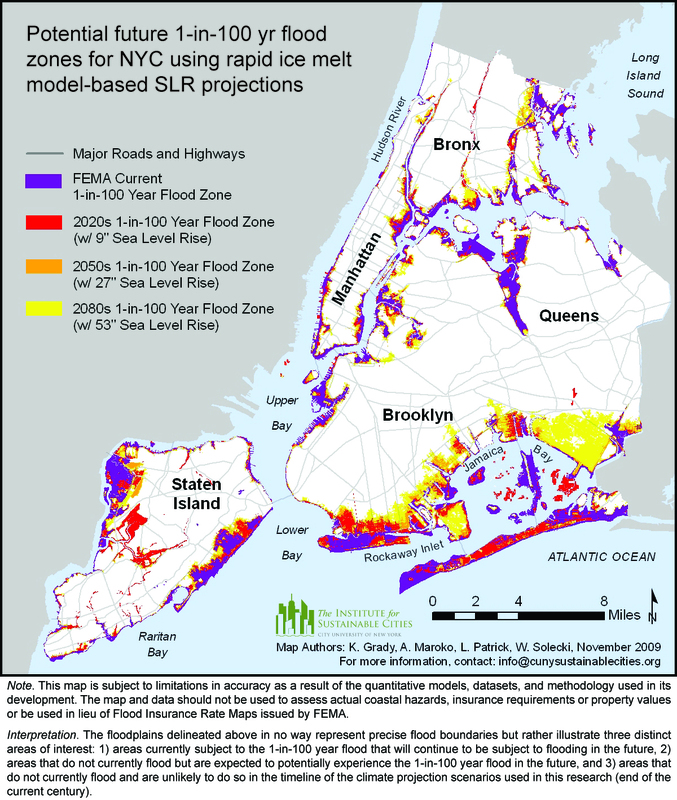 New York City and the surrounding metropolitan region, as well as many other coastal cities, face the prospect of accelerated sea level rise and increased coastal flooding. With over 600 miles of densely populated shoreline, New York City ranks among the top ten port cities today in terms of population vulnerable to coastal flooding, and second only to Miami with assets exposed to coastal flooding[iv]. By the 2070s, New York City is projected to remain among the top ten coastal cities with assets at risk. New York City already experiences a number of coastal hazards. Sea level in the New York City metropolitan area has been rising between 2.2 and 3.8 cm (0.86-1.5 in) per decade for over a hundred years, as recorded on tide gauges. This includes a contribution of 0.86-1.1 cm (0.34-0.43 in) per decade from regional subsidence, predominantly due to glacial isostatic effects[v]. Historically, most sandy beaches along the south shore of Long Island (including the Rockaways and Coney Island) and northern New Jersey have been eroding and have had to be periodically nourished by the U.S. Army Corps of Engineers by dredging sand from offshore and dumping it on the beaches. While some New York City area salt marshes are thriving, recent studies show serious losses at Jamaica Bay and elsewhere within the last several decades[vi]. Although the exact causes have not yet been determined, it is believed that the marshes are victims of multiple stressors, including sea level rise, water pollution, dredging, and other human-caused disturbances. The city is no stranger to tropical cyclones, in spite of its northerly location. A hurricane struck the city in 1821, producing a surge of 13 feet in 1 hour that flooded lower Manhattan as far north as Canal Street. In 1893, another hurricane submerged southern Brooklyn and Queens, erasing a small barrier island off the Rockaways. During the 20th century, the “Long Island Express” (1938), hurricane Donna (1960), and the weaker hurricane Gloria (1985) created extensive damage on nearby Long Island and in New Jersey. Even extra-tropical winter storms, such as the nor’easter of December, 1992, can result in widespread flooding of low-elevation neighborhoods and seriously disrupt ground and air transportation (Fig. 3). Fig. 3. 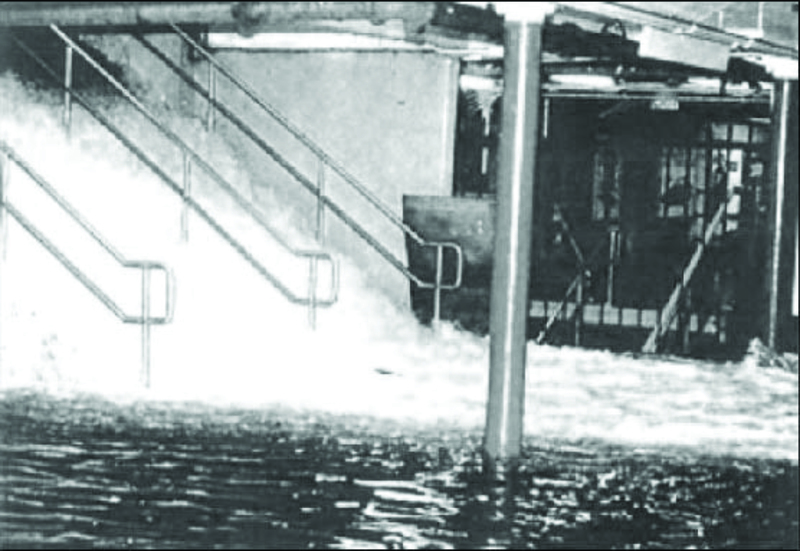 Flooding of the Hoboken Path Station, New Jersey during the December, 1992 nor’easter. (New York City Office of Emergency Management). In 2008, Mayor Michael Bloomberg convened the New York City Panel on Climate Change (NPCC), consisting of experts from the Goddard Institute for Space Sudies (GISS), Columbia University, other regional universities, and the private sector to advise the government of New York City on climate risks and on ways of adapting to climate change. As part of the city’s development of comprehensive climate change adaptation policies, the NPCC provides information on future risks stemming from changes in temperature, precipitation, and sea level rise. In the NPCC 2010 report[vii], future sea level rise was projected for New York City for a combination of 7 Global Circulation Models (GCMs) and 3 emissions scenarios (IPCC SRES A2, A1B, and B2). 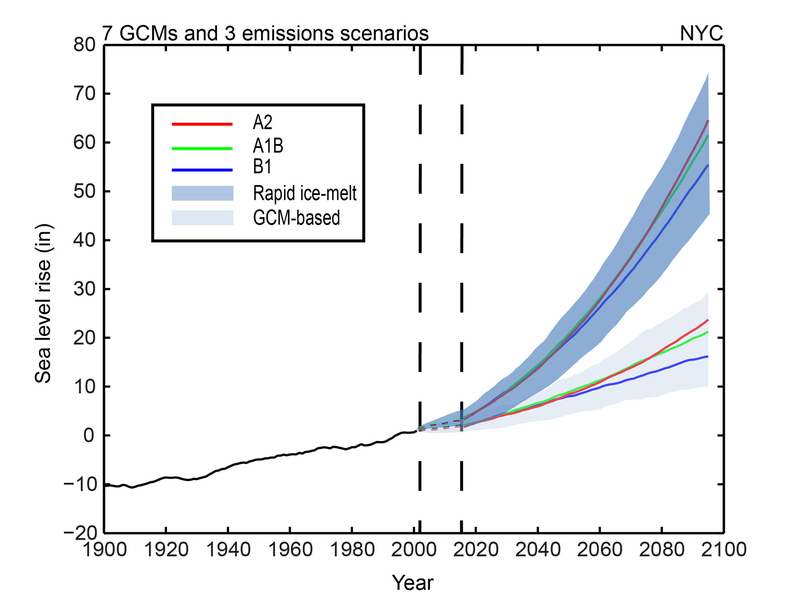 One set of projections, based on IPCC methodology, include global contributions from thermal expansion and meltwater (glaciers, ice caps, and ice sheets). Local effects include land subsidence (see above) and changes in water height due to local changes in ocean temperature, salinity, currents, and other factors. Inasmuch as the IPCC may have underestimated the potential for accelerated ice sheet melting, an upper-bound “rapid ice melt” scenario, based on paleoclimate analogs, was created. Differing only in the meltwater term, it assumes that glaciers and ice sheets will melt at rates comparable to those following the last Ice Age, when sea level climbed rapidly over a ~10,000-12,000 year period at an average rate of 0.39-0.47 in/yr (10-12 mm/yr). In this scenario, meltwater is assumed to rise exponentially from the present mean ice melt rate of 1.1 cm/decade between 2000 and 2004, reaching a meter by the end of the century. The GCM-based projections show a sea level rise of 7 to 12 inches (18 to 30 cm) by the 2050s and 12 to 23 inches (30 to 58 cm) by the 2080s (Fig. 4). In the rapid ice-melt scenario, sea level jumps to ~41 to 55 inches (104 to 140 cm) by the 2080s. Figure 4. Observed (black line) and future sea level rise, New York City. The pale-shaded blue shows the full range of projected GCM-based sea level rise; the dark-shaded blue shows the full range of projected sea level rise for the rapid ice-melt scenario. The colored lines indicate averages for each of the emissions scenarios across the 7 GCMs. (CCSR, 2011). The sea level rise is likely to increase the frequency, intensity and duration of coastal flooding. IPCC-derived projections suggest that sea level rise alone will shrink the return period for the 1-in-100 year flood to once in 15 to 35 years by the 2080s. The return interval for the 1-in-10 year event is reduced to once in 1 to 3 years by the 2080s because of sea level rise[viii]. A higher average sea level would exacerbate city street, basement, and sewer flooding and create more frequent transportation disruptions (Fig. 5). It would increase rates of beach erosion, necessitating additional beach nourishment programs. Saltwater would encroach further on freshwater sources, potentially causing structural damage to infrastructure and affecting some Long Island aquifers. Figure 5. Areas flooded in New York City by the 1-in100-year flood with future sea level rise, assuming rapid ice melt. Current FEMA 1-in100-year flood zone (purple); with sea level rise by the 2020s (yellow); 2050s (orange); 2080s (red). (NPCC, 2010). Given that temperature and sea level rise are already increasing, the NPCC recommended that New York City should begin adapting to climate change now. Inasmuch as the extent of future sea level rise is uncertain, an effective response involves “flexible adaptation pathways” that can be updated regularly based on periodic monitoring and re-assessment of the latest climate change information[ix]. Other recommendations include preparing an inventory of infrastructure and assets at risk, linking adaptation strategies to capital and rehabilitation cycles, and developing a set of climate-resilient design and performance standards—tasks already begun by the New York City Climate Change Adaptation Task Force. One of the most important recommendations, in terms of sea level rise and coastal flooding, is to update the current 1-in-100 year flood zone maps to incorporate data on future sea level rise (e.g., Fig. 5) [x]. An important goal of the recent New York City Comprehensive Waterfront Plan is to increase the city’s resilience to sea level rise[xi]. The Waterfront Plan endorses the iterative, risk-management approach outlined in the NPCC 2010 report. It recommends adapting existing storm emergency preparations to respond to climate change. Raising public awareness through education and community outreach is another means of building resilience. It furthermore proposes a number of adaptive approaches, for example upgrading climate risk data bases (including LIDAR mapping), assessing critical infrastructure vulnerabilities, flood-proofing buildings in vulnerable zones, and implementing protective strategies (such as building seawalls, bulkheads, or breakwaters). “Soft” measures include restoring wetlands and beaches, raising dunes, or adding fill to elevate buildings. Although originally developed for New York City, the NPCC approach is sufficiently general, so it can be adapted to the needs of other coastal metropolitan areas in the U.S. and abroad. Many of the world’s largest cities are located along the coast, often on low-lying, subsiding deltas. These cities include (other than New York City) Dhaka, Mumbai, Calcutta, Shanghai, Guangzhou, Hong Kong, Ho Chi Minh City (Saigon), Bangkok, Tokyo, Manila, Sydney, Lagos, Dakas, Alexandria, London, Rotterdam, Hamburg, Miami, New Orleans, Los Angeles, San Francisco, Seattle, and Vancouver. To varying degrees, these cities can expect to encounter increased land submergence and flooding from coastal storm surges and heavy rainfall, in addition to other climate-related hazards, as summarized in the First Assessment Report on Climate Change and Cities (ARC3)[xii]. New York City’s preparatory steps outlined in the NPCC 2010 report provide an important model for helping other cities mitigate and adapt to climate change. Disclaimer: The opinions expressed in this article are those of the author and do not represent the official views of Columbia University CCSR, NASA Goddard Institute for Space Studies, or the sponsoring agencies. [i] McGranahan, G., Balk, D., and Anderson, B. The Rising Tide: Assessing the Risks of Climate Change and Human Settlements in Low Elevation Coastal Zones. Environment & Urbanization 19, no 1 (2007):17-37. [ii] Nicholls, R.J., Hanson, S., Herweijer, C., Patmore, N., Hallegatte, S., Corfee-Morlot,J., Ch>teau, and Muir-Wood, R. Ranking Port Cities with High Exposure and Vulnerability to Climate Extremes: Exposure Estimates. Organisation for Economic Co-operation and Development OECD Environment Working Papers No. 1, OECD ENV/WKP(2007)1. (2008). [iii] Crowell, M., Coulton, K., Johnson, C., Westcott, J., Bellomo, D., Edelman, S., and Hirsch, E. An Estimate of the U.S. Population Living in 100-Year Coastal Flood Hazard Areas. Journal of Coastal Research 26, no. 2 (2010): 201-211. [iv] Nicholls et al. (2008). [vi] Hartig, E.K., Gornitz, V., Kolker, A., Mushacke, F. And Fallon, D., 2002. Anthropogenic and climate-change impacts on salt marsh morphology in Jamaica Bay, New York City. Wetlands, 22, 71-89. Hartig, E.K. and Gornitz, V., 2005. Salt Marsh Change, 1926-2003 at Marshlands Conservancy, New York. Long Island Sound Research Conference Proceedings. [vii]Rosenzweig, C. and Solecki, W., eds., 2010. Climate Change Adaptation in New York City: Building a Risk Management Response. New York City Panel on Climate Change 2010 Report. Annals of the New York Academy of Sciences, v. 1196, 354pp. http://www.nyas.org. [viii] Extreme flood records from the Battery tide gauge were used to calculate the 1-in-10 year events. Because hourly data are unavailable prior to 1960, the 100-year flood return curve (or “stage-frequency relationship”) for New York City was obtained from a U.S. Army Corps of Engineers hydrodynamic model that includes both surge and tidal components (see Gornitz, V., Couch, S., and Hartig, E.K., Impacts of sea level rise in the New York City metropolitan area. Glob. and Planet. Change, 32 2002, 61-88). [ix] Rosenzweig, C. and Solecki, W.D. eds., 2010 (see above); Rosenzweig, C. and Solecki, W.D. and 15 others, 2011. Developing coastal adaptation to climate change in the New York City infrastructure-shed: process, approach, tools, and strategies. Climatic Change 106, 93-127. Horton, R., and Rosenzweig, C., 2010: Climate Risk Information, New York City Panel on Climate Change. Ann. New York Acad. Sci. , 1196, 147-228, doi:10.1111/j.1749-6632.2010.05323.x. Major, D.C., and M. O’Grady, 2010: Adaptation Assessment Guidebook, New York City Panel on Climate Change. Ann. New York Acad. Sci. , 1196, 229-292, doi:10.1111/j.1749-6632.2010.05324.x. Solecki, W., Patrick, L., and Brady, M, 2010: Climate Protection Levels, New York City Panel on Climate Change. Ann. New York Acad. Sci. , 1196, 293-352, doi:10.1111/j.1749-6632.2010.05325.x. [xi] New York City Department of City Planning, March 2011. Vision 2020: New York City Comprehensive Waterfront Plan. [xii] Rosenzweig, C., Solecki, W.D., Hammer, S.A., and Mehrotra, S., eds. 2011. Climate Change and Cities: First Assessment Report of the Urban Climate Change Research Network. This entry was posted in climate, water and tagged adaptation, Bloomberg, carbon dioxide, climate change, Coney, erosion, flooding, global warming, ice, Jamaica Bay, long island, meltwater, New York City, population, Rockaway, sea level rise, urban, Vivien Gornitz, waterfront plan. Bookmark the permalink.